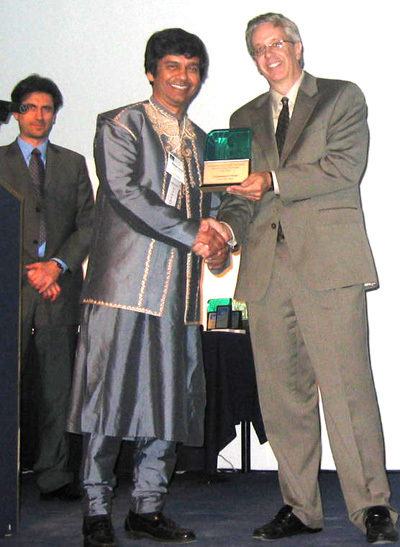 Manick Sorcar receives the "ILDA 2005 Artistic-Award" for his "Enlightenment of Buddha", by winning the First Place in international competition for "Best Use of Lasers in Live Stage Performance". From Left Dirk Baur ( President ILDA), Manick Sorcar, and Patrick Murphy ( Executive Director, ILDA). 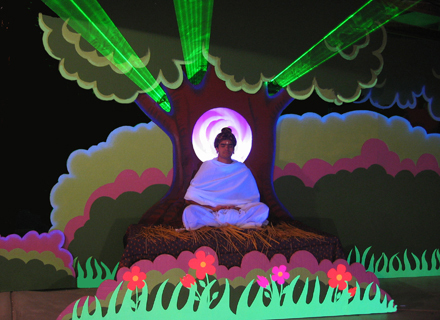 Manick Sorcar’s “Enlightenment of Buddha”, a laser show in combination with live performance on stage won the highest award for outstanding artistic achievement at the 2006 annual conference of the International Laser Display Association (ILDA), held at the award banquet, Hotel Le Conchiglie, Rimini, Italy. ILDA's awards for artistic and technical excellence, the industry's equivalent of Hollywood's Oscars, each year honor companies from around the world for artistic and technological achievement. Manick Sorcar’s company LaserLightMagic, which produced the show, won the "ILDA 2005 Artistic-Award" in the category of “Best Use of Lasers in a Live Stage Performance”, by defeating entrees from Germany, Italy, United Kingdom, USA, Russia, France, Japan and the Netherlands. "Enlightenment of Buddha" is an extravaganza of dance, drama, magic in combination with various forms of intelligent lighting, life-size laser-animation and three dimensional laser effects in space. The story takes the audience to approximate 600 BC India, where a meditating Siddhartha Gautama (whom the world would later know as Lord Buddha) under a Peepal tree, remained undisturbed and attained enlightenment despite constant disruption from enemy Devaputra Mara and his string of bone-chilling, intimidating black magic. In a short speech on stage, after receiving the award, Manick said "I am thrilled. Although this show represents a small portion of Lord Buddha’s life, it is a gigantic step in the use of the cutting-edge technology of laser for artistry on stage. It is heart-warming to see the international panel of judges recognized the creativity I put with the help of the cutting-edge technology, where I used the narrow, strong beam of lasers as a paint brush." “Enlightenment of Buddha” was first performed in October, 2005 at the Denver Center for Performing Arts, Colorado, for the 25th anniversary of the Asian Pacific Development Center (APDC), attended by many dignitaries from across the country including Denver Mayor John Hickenlooper. The show received repeated thundering applause from the audience and rave reviews from the press and media. 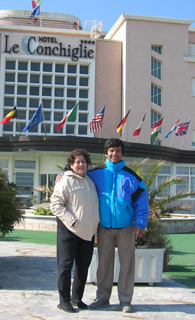 Hotel Le Conchiglie, in Rimini, Italy. Manick Sorcar shot to fame in early nineties for his first animation mixed with live action “Deepa & Rupa: A Fairy Tale From India”, which won the Gold Plaque at the Chicago International Film Festival. His other films, also based on fables from India, received world recognition by winning a series of prestigious awards at various international film festivals. Recognized as the cultural bridges between East and West, his animation films are popular at the elementary schools as well as at the Public Broadcasting Service (PBS) TV stations, where on the New Year’s Day, they have been telecast consecutively for the last fourteen years in Colorado. Last year, his animation films were the subject of a research paper for an American student’s bachelor’s degree in fine arts at the Savannah College of Fine Arts, Savannah, Georgia. Manick is the author of several lighting design texts that are taught at universities and has a full-time job as the CEO and president of Sorcar Engineering, Inc., which did the lighting designs for Denver International Airport, sport centres in Japan, Colorado Convention Center, and palaces for Saudi princes. By night, he is an artist and animator. Laser is to Manick what the magic wand is to the traditional magician. “I practice the science of laser during day. At night, I apply it for art. I just marry the two in my stage shows”, said Manick. Manick Sorcar is the first Indian-American to receive the prestigious ILDA Artistic-award.